Because there are a lot less ST35s floating around, there aren't really any boards with modern circuits that fit into the original chassis. 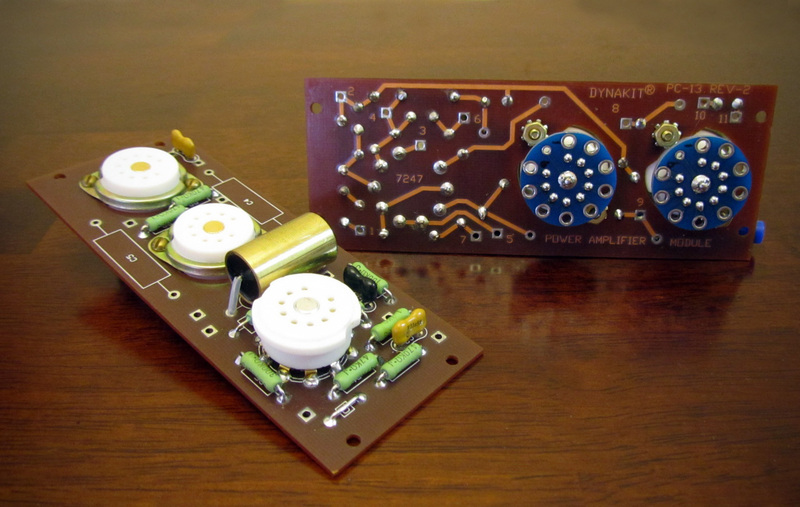 Shannon Parks of DIYTube has created a brand new circuit board that is similar to the ST35 circuit with some modern sensibilities if one would like to go that route. 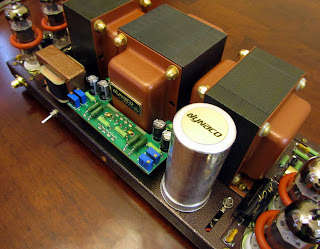 I prefer the looks of the original ST35 chassis myself, with the exposed PCBs on the ends. For this, I turned to Dynakit Parts. 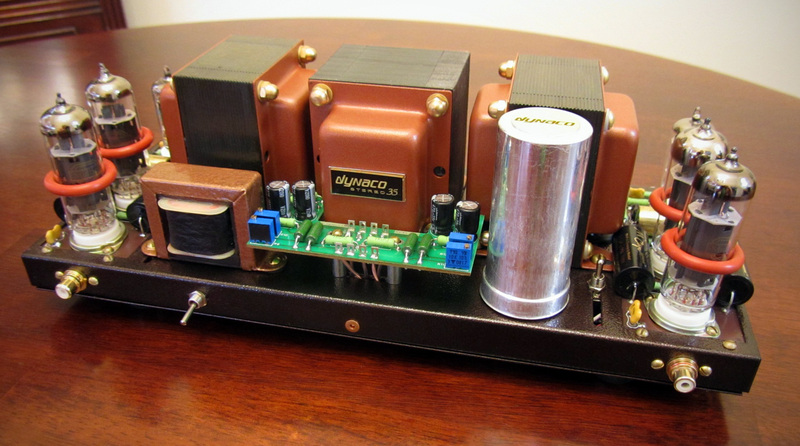 Dynakit Parts is a company based in Clifton, New Jersey and has an impressive selection of old school reproductions of Dynaco products. 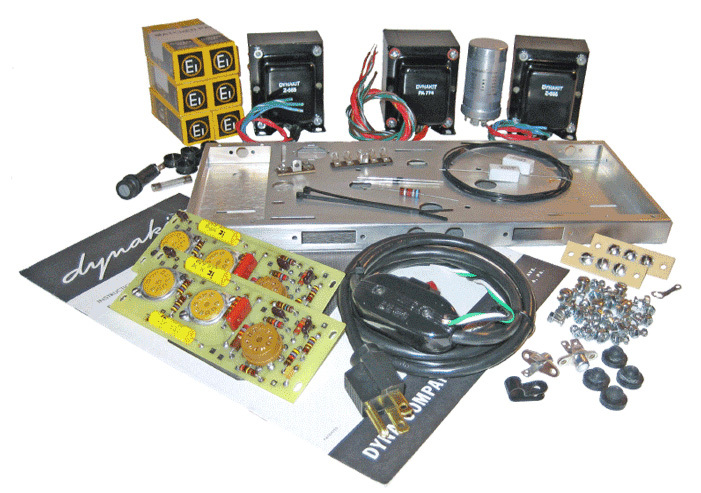 The kits are about as close to the originals as you can get, from the can capacitor to the screw-down terminal strips. 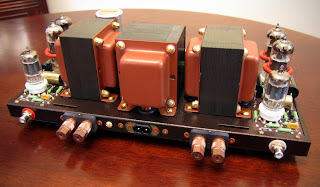 Rather than purchasing the whole kit, I purchased a number of the parts a la carte, as I was interested in adding a little bit of customization to the kit with a power choke, power switch, triode / ultra-linear switches, a C8 power inlet for a custom C7 removable power cord and a number of boutique parts. 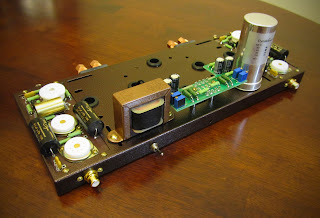 I also added the ST35-BCU bias control upgrade kit which fits nicely above the chassis. 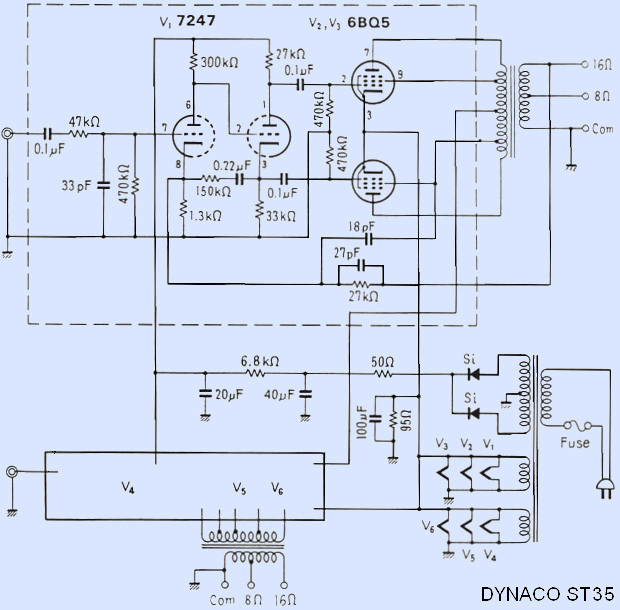 As stated on the Dynakit site: The ST35-BCU employs an adjustable fixed bias circuit which allows for user adjustment of the bias setting of each (EL84) output tube via (4) separate on board precision bias pots. 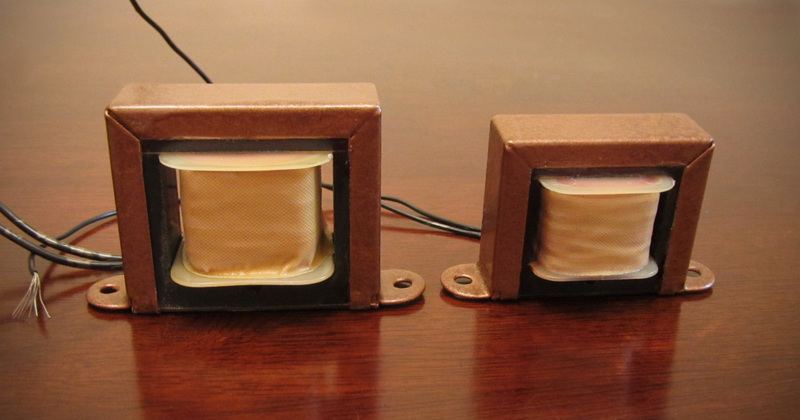 This allows you to not have to purchase a matched set of power tubes. 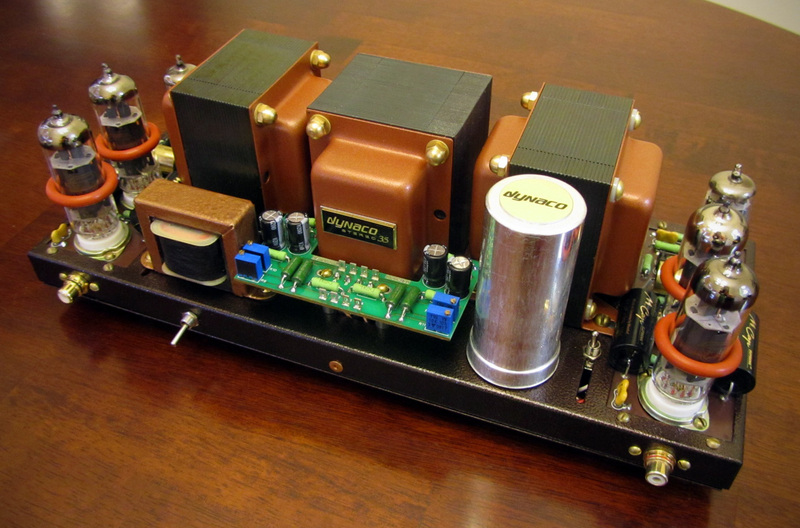 And even if you did purchase a matched quad, power tubes tend to age differently, so they can be adjusted after this occurs. I elected to populate the small driver / power boards with Kiwame carbon film resistors, Obbligato and Mundorf Supreme film capacitors and Teflon and ceramic tube sockets (the Teflon sockets even have beryllium copper contacts). The caps fit pretty much perfectly, although the Mundorfs will have to be mounted once the boards are mounted due to sizing constraints. The Dynakit build calls for nicer silver mica capacitors in place of the ceramic disc capacitors that were in the older units. These can be found just about anywhere (Mouser, Digikey, Partsconnexion, Handmade, etc.). I chose to go with the cadmium metal chassis as opposed to the newer stainless steel version as the chassis is going to be powder-coated; no need to pay extra for that chromed-out finish when no one's going to see it ;) Below you will see the chassis, I've enlarged the holes to fit the Cardas binding posts and RCAs, and the center hole has been enlarged to hold a piece of FR4 material that will then hold the C8 inlet in place. I then gave the chassis a nice sanding and labelled it for the powder-coater. One thing I would be painting myself was the power choke. 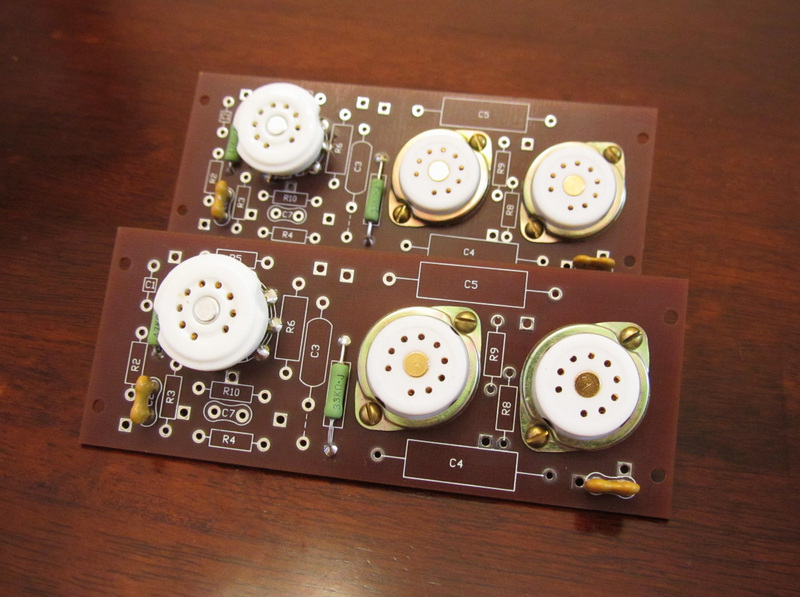 A choke is a nice cheap upgrade for the ST35 and helps reduce ripple in the power supply. 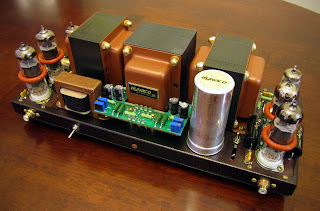 A number of people have used the C354 to replace the 50 ohm resistor, I chose a Hammond 156R with 56ohms DCR, which is pretty much the equivalent. Chokes tend to be on the ugly side, so if they aren't hiding in the chassis (there's absolutely no room in this case), they need to be dressed up a bit. I was prepping two at once, one for the ST35 and one for the Millett Jonokuchi. The first step in this process is to sand down the metal frame on the choke. Then painters tape is cut and applied to mask off the inside. I've seen some builders just paint the whole thing, but I don't really care for that look. Next I apply two layers of primer, one per hour, then multiple coats of Hammertone paint. It can be difficult to get the Hammertone paint to lay correctly without making the coat too thick. Any over-spray is corrected using black permanent ink. Once dry, I measured and cut some strips of black leather and used some epoxy to keep them in place, wrapping around the spool of the choke. I use a couple layers of leather when possible to give the spool a fuller look, it's more aesthetically pleasing. 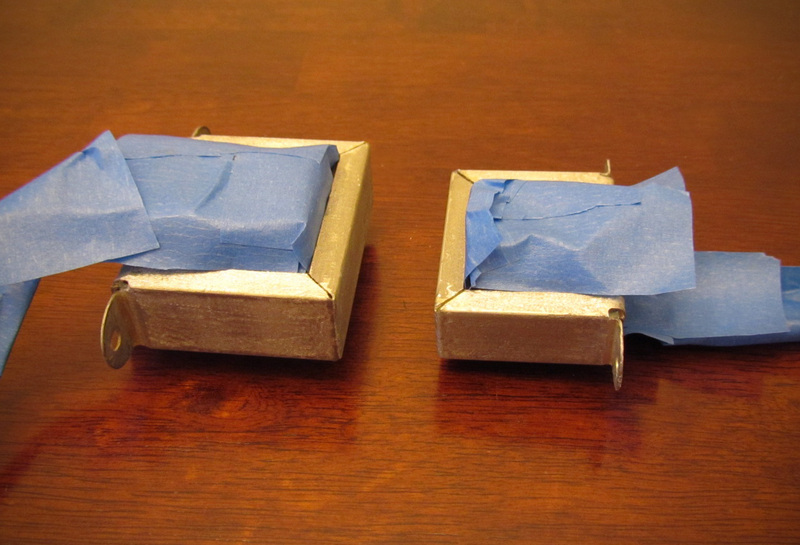 Completed chokes with leather wrapping the spool. UPDATE (6/19/11): The parts arrived for the ST35 power / driver boards, so I went ahead and populated everything except for C4 and C5, which will be 0.1uF Mundorf Supremes that will hang off the board just a bit and will need to be installed once the boards are fastened to the chassis. 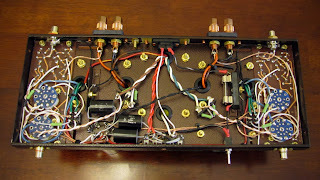 C1 was not used per Bob Latino's suggestion as its purpose is DC input blocking and nearly all modern-day preamps already have a DC blocking output cap, so I used a pair of thick leads to short C1. As you can see below, the Teflon tube sockets have blue PCB boards installed to ease the soldering process. The sockets had a rather long ground pin that I trimmed down and sanded smooth as there would have been a clearance issue in the height challenged chassis. UPDATE (7/8/11): The chassis is pack from the powder-coater so I was able to fit the boards in place. I opted to install them rotated 180 degrees as I wanted the RCAs on the rear of the chassis and there wasn't sufficient clearance with the power tube sockets blocking the way. 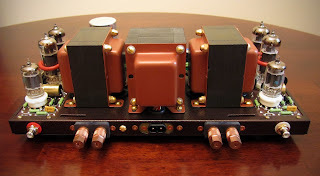 I took some generic gold-plated RCAs from my parts bin and trimmed off the back with a cutting disc, rendering them nonfunctional but small enough to squeeze between the tube socket and the chassis front, simply for the sake of aesthetics. 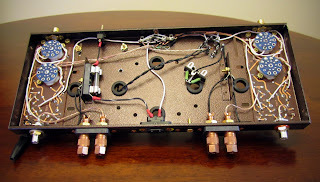 I was also able to position the painted Hammond filter choke, attach the Cardas copper binding posts and install the Cardas rhodium plated RCA jacks. Also installed was the large silver multicap and the bias control board from Dynakitparts. 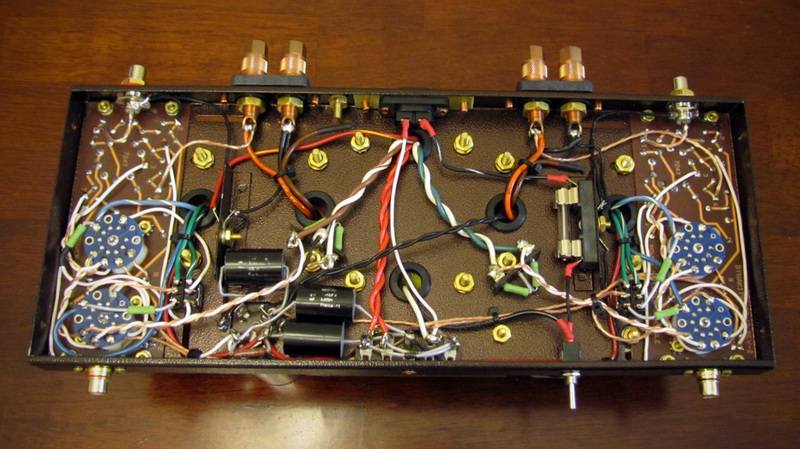 In the interest of making things convenient, I installed a small 6A SPST toggle switch on the front panel of the chassis so the amp can be powered on and off conveniently. The ST35 Bias Control Unit from DynakitParts makes use of an adjustable fixed-bias circuit, allowing for adjustment of the bias setting of each EL84 power tube via four separate precision bias potentiometers. 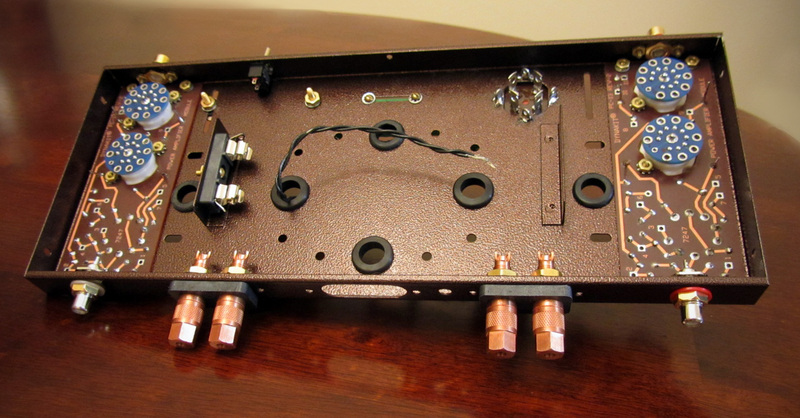 The initial wiring was completed using Kimber TCSS 19 gauge stranded copper in teflon dielectric. I opted to drill out the area originally designated for the fuse holder and the cable in the interest of fitting a C8 power inlet. Because the re-purposed real estate on the chassis back was a little too large for the C8 inlet, I mounted it to a piece of FR-4 material and then mounted the combo to the chassis. This adds a degree of convenience, allowing a removable C7 power cord to be used to power the amp. The fuse was then moved inside the unit and mounted to one of the chassis braces, really a perfect place for it in my humble opinion. 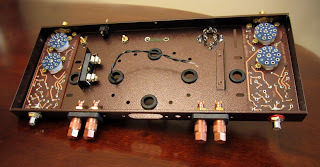 Grounding lugs were added to both chassis braces to connect to the RCA grounds (the Cardas RCAs are insulated from the chassis unlike the stock Dynaco RCAs) and the negative connector of the speaker binding posts. UPDATE (7/28/11): The transformer bell-ends arrived back from the powdercoater and were reattached to the iron with brass hardware. Rather than using the cut transformer wire, I prefer the Kimber TCSS Teflon wire for all extraneous point-to-point wiring. The dielectric doesn't melt, it's a little thinner so it's easier to route, and I'd imagine the copper's of a higher purity. I opted to add a set of three 1uF 630V Solen film capacitors as bypass caps for the can capacitor. 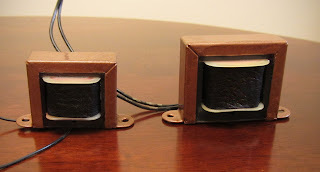 The Solen film caps are only a couple bucks a pop and have the potential to add refinement to the power supply. It's a narrow fit in the ST35 case, no room for zip tie mounts for the caps. 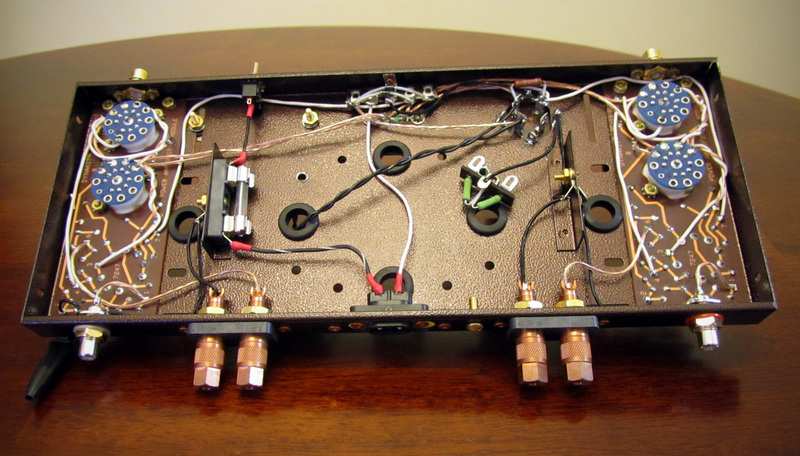 The wiring was finalized by adding a pair of DPDT switches to manage the triode and ultralinear switching. 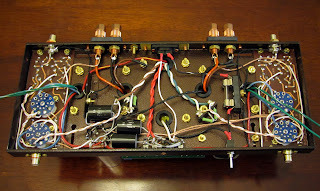 This was wired based on the following advise from Bob Latino and Tazsmonn on the DynacoTubeAudio Forum: Remove green or green white wire from pin #9 of each tube and solder to separate poles of DPDT switch on the same end, Solder wire from pin #9 to center pole of DPDT switch, Solder 100 ohm [resistor] from pin #7 to DPDT switch opposite end from green or green white wire, All wiring to and from switch side must be to same tube. UPDATE 8/8/2011: I was able to have a pair of custom engravings made for the unit. A 1" gold circle with the word "Dynaco" engraved in black and a small rectangle with a Dynaco Stereo 35 logo that I made in Adobe Illustrator. These are the final touch. Why not build covers for pcb and choke? I think that one of the things that's distinctive about the Dynaco kits is the exposed PCBs. 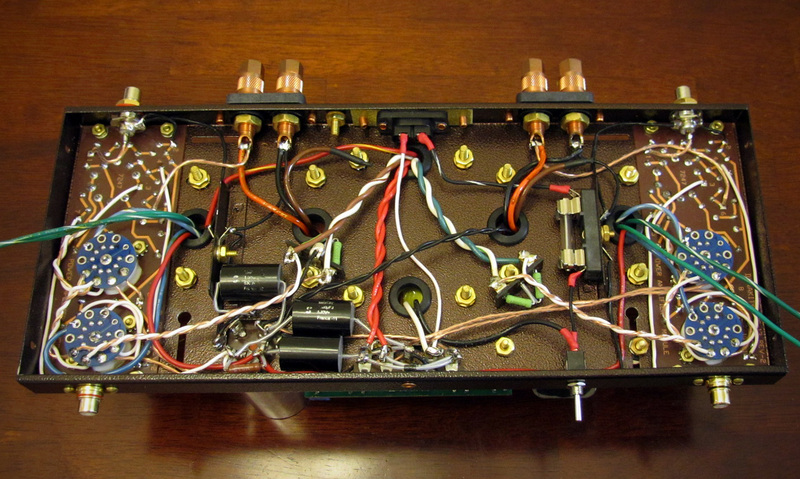 If you'd like the PCB to hide below the unit, the DIYTube build would be pretty ideal. What I meant was that you've gone through great length to make the chassis and transformer bells look good but my eyes are drawn towards other exposed parts. Just my opinion. good stuff under a cover? I wanted to ask you, politely, the value used for capacitors solen as bypass. Forgive my curiosity, has a reference to offer me to where to buy, online, the brass screws fixation of transformers? 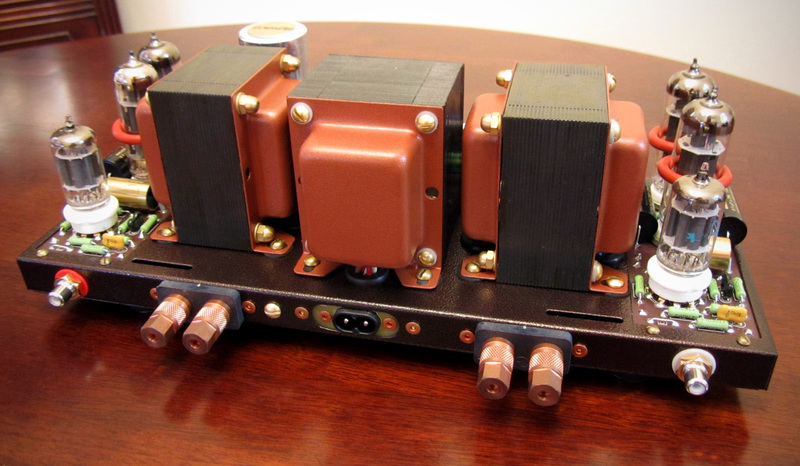 They were 1.0uF 630V if I recall correctly, basically the largest that would fit in that tiny chassis. Brass hardware can be purchased at Home Depot, Lowes, Bolt Depot Online, and Amazon, among others. 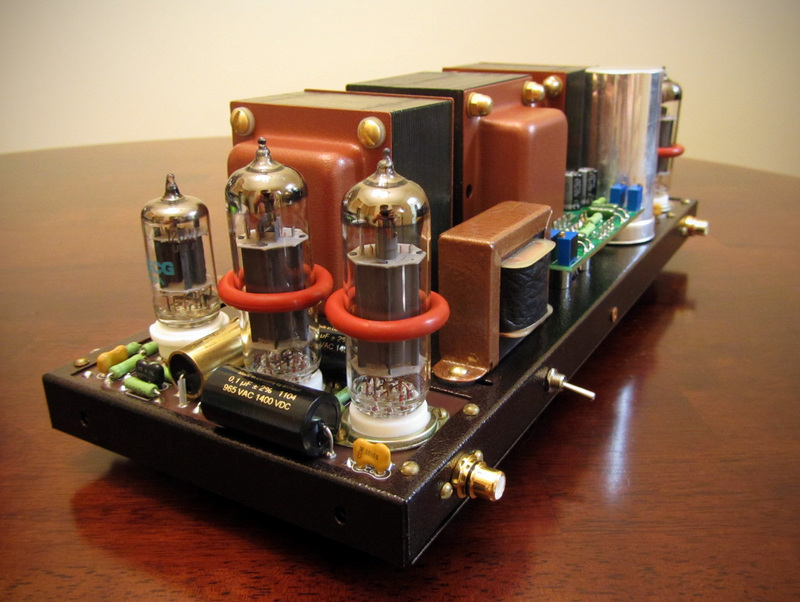 That has got to be the coolest looking tube amp I have ever seen. 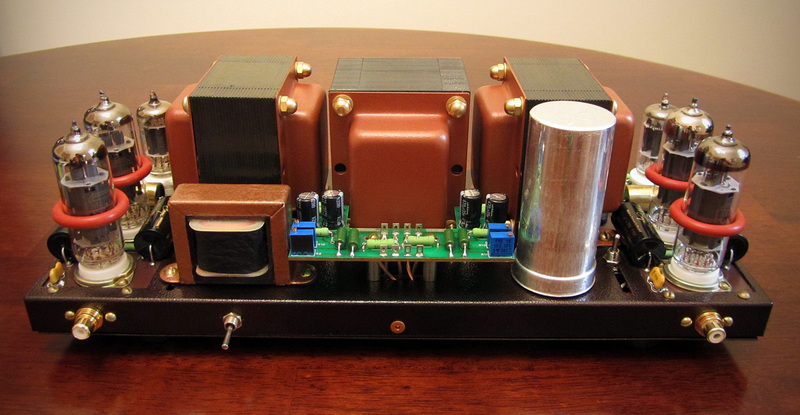 I am in the market for a tube amp to drive my mid horns in my tri amp system. Could you share your color scheme? I have seen the several ST35 kits out there, and they all could use a bit of dressing up. Many thanks for the compliment JJL. I had the chassis powdercoated locally, but I'd imagine your local shop will have similar colors. 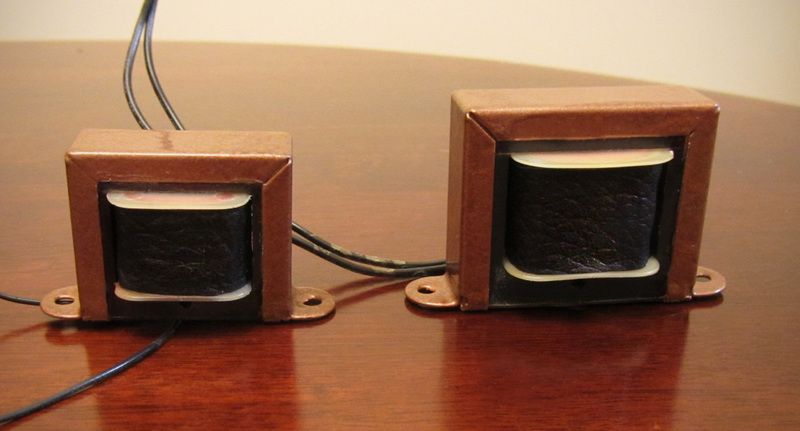 It's "antique copper" for the main chassis and "copper" for the transformer bells. Check out Dynakit Parts to get a very accurate ST35 chassis like the one used above. Dyankit Parts has the cadmium chassis listed as out-of-stock. I'll have to contact them. Since mine will be a midrange amp only, I wonder if current ripple will be an issue, probably not, so I won't need that extra choke on top. DIYTube disscusses the Gillespie performance mod that adds a couple of tiny boards underneath to adjust bias. If I understand correctly, the Dynakit Parts kit without their optional board mounted in the front center does not allow for any bias adjustment at allall? I have read about the Gillespie mod (http://www.tronola.com/html/efb_in_a_dynaco_st-35.html) and many people think very well of it. The Dynakit Bias Unit is nice as you can easily adjust from outside the chassis, but with a little tweaking the Gillespie could be adjustable from the outside too. 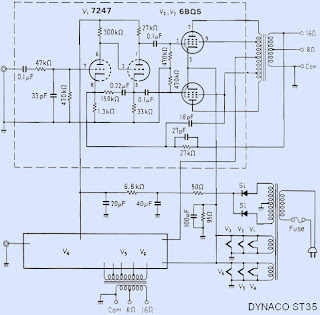 You can see what's included with the basic dynakit ST35 Bias circuit here: http://www.dynakitparts.com/store/product.aspx?id=5 - no adjustment pots. 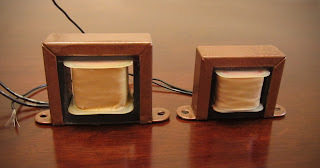 How has the paint on the transformers held up to the heat?